Bill has harbored a passion for the margins of American politics since seeing the second Nixon-Agnew inaugural and spending afternoons on breaks from his paper route, where he learned that the most meaningful things you need to know about the American Executive Branch can be found on the back pages of our newspapers between ads for Earl Scheib and Woolworth’s Semi-Annual White Sale. Retired from elective politics since the age of 19, Bill never misses an electoral season. 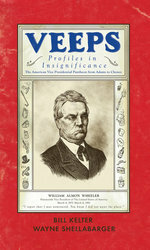 Besides Veeps: Profiles In Insignificance, his 2008 Top Shelf collaboration with friend and artist Wayne Shellabarger, he has contributed his observations on the American Vice Presidency to Politico and Powells.com. Bill is a resident of Lake Oswego, Oregon, and a member of the Portland business community, where, unlike so many of his Vice Presidential heroes, he prefers to do his job quietly and without public fanfare.